Leave a Lasting Legacy at FIDV: Help Our Heroes Heal! 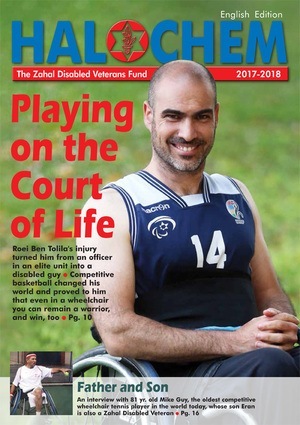 You can help ensure that Friends of Israel Disabled Veterans-Beit Halochem will always be there to provide direct services and rehabilitation programs at the Beit Halochem centers in Haifa, Tel Aviv, Jerusalem, Beer Sheva, and the future center at Ashdod. Please consider becoming a Member of our FIDV Warrior Legacy Society/ Moreshet Lochamim. Your bequest to FIDV-Beit Halochem in your estate plans will go a long way toward ensuring that Beit Halochem will always be there for the veterans, now and in years yet to come. Learn more: Just click the links for a description of the FIDV Warrior Legacy Society / Moreshet Lochamim and the FIDV Letter of Intent, for further information. Please review the below Sample Bequest Language with your legal advisor. You will be building an enduring legacy. It will state clearly your priorities, and what is most important to you! Why is this important? FIDV-Beit Halochem helps 51,000 disabled veterans, their families, and survivors of terror attacks, by providing a variety of individualized therapies, cultural and family activities, sports challenges, and scholarships for higher education and training. At Beit Halochem there is a meeting of generations. Disabled veterans from as far back as the War of Independence inspire the younger men and women wounded recently in combat and training activities. Friendships are formed, isolation is minimized, a community of healing and support is created, and lives are changed for the better! Act now: If you have not yet planned a legacy gift for FIDV-Beit Halochem, now is the perfect time to take action to assure your place in the FIDV Warrior Legacy Society. The true beneficiaries of your legacy gift will be the men and women who have served Israel so valiantly. They and their families will be forever grateful. I hereby give, devise, and bequeath to the Friends of Israel Disabled Veterans – Beit Halochem, a nonprofit corporation having its principal offices at 1133 Broadway, Suite #232, New York, NY 10010, the sum of $______________ to be used for its general charitable purposes. I hereby give, devise, and bequeath to the Friends of Israel Disabled Veterans – Beit Halochem, a nonprofit corporation having its principal offices at 1133 Broadway, Suite #232, New York, NY 10010, all (or %____) of the rest residue or remainder of my estate, to be used for its general charitable purposes. I hereby give, devise, and bequeath to the Friends of Israel Disabled Veterans – Beit Halochem, a nonprofit corporation having its principal offices at 1133 Broadway, Suite #232, New York, NY 10010 (insert detailed description of property) to be used for its general charitable purposes.